Q: What is performance testing? A: Although performance testing is described as a part of system testing, it can be regarded as a distinct level of testing. Performance testing verifies loads, volumes and response times, as defined by requirements. Q: What is load testing? A: Load testing is testing an application under heavy loads, such as the testing of a web site under a range of loads to determine at what point the system response time will degrade or fail. Q: What is installation testing? A: Installation testing is testing full, partial, upgrade, or install/uninstall processes. The installation test for a release is conducted with the objective of demonstrating production readiness. This test includes the inventory of configuration items, performed by the application’s System Administration, the evaluation of data readiness, and dynamic tests focused on basic system functionality. When necessary, a sanity test is performed, following installation testing. Q: What is security/penetration testing? A: Security/penetration testing is testing how well the system is protected against unauthorized internal or external access, or willful damage. This type of testing usually requires sophisticated testing techniques. Q: What is recovery/error testing? A: Recovery/error testing is testing how well a system recovers from crashes, hardware failures, or other catastrophic problems. Q: What is compatibility testing? Q: What is comparison testing? A: Comparison testing is testing that compares software weaknesses and strengths to those of competitors’ products. Q: What is acceptance testing? A: Acceptance testing is black box testing that gives the client/customer/project manager the opportunity to verify the system functionality and usability prior to the system being released to production. The acceptance test is the responsibility of the client/customer or project manager, however, it is conducted with the full support of the project team. The test team also works with the client/customer/project manager to develop the acceptance criteria. Q: What is alpha testing? A: Alpha testing is testing of an application when development is nearing completion. Minor design changes can still be made as a result of alpha testing. Alpha testing is typically performed by a group that is independent of the design team, but still within the company, e.g. in-house software test engineers, or software QA engineers. A: Beta testing is testing an application when development and testing are essentially completed and final bugs and problems need to be found before the final release. Beta testing is typically performed by end-users or others, not programmers, software engineers, or test engineers. Q: What is a Test/QA Team Lead? A: The Test/QA Team Lead coordinates the testing activity, communicates testing status to management and manages the test team. Q: What testing roles are standard on most testing projects? A: Depending on the organization, the following roles are more or less standard on most testing projects: Testers, Test Engineers, Test/QA Team Lead, Test/QA Manager, System Administrator, Database Administrator, Technical Analyst, Test Build Manager and Test Configuration Manager. Depending on the project, one person may wear more than one hat. For instance, Test Engineers may also wear the hat of Technical Analyst, Test Build Manager and Test Configuration Manager. You CAN get a job in testing. Click on a link! Q: What is a Test Engineer? • Save the reputation of your company by discovering bugs and design flaws; before bugs and design flaws damage the reputation of your company. Q: What is a Test Build Manager? 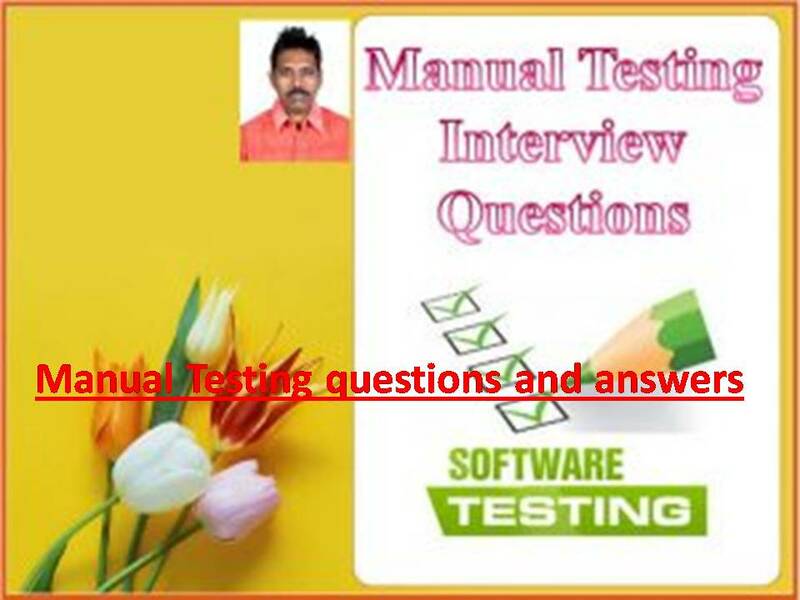 A: Test Build Managers deliver current software versions to the test environment, install the application’s software and apply software patches, to both the application and the operating system, set-up, maintain and back up test environment hardware. Depending on the project, one person may wear more than one hat. For instance, a Test Engineer may also wear the hat of a Test Build Manager. Q: What is a System Administrator? A: Test Build Managers, System Administrators, Database Administrators deliver current software versions to the test environment, install the application’s software and apply software patches, to both the application and the operating system, set-up, maintain and back up test environment hardware. Depending on the project, one person may wear more than one hat. For instance, a Test Engineer may also wear the hat of a System Administrator. Q: What is a Database Administrator? A: Test Build Managers, System Administrators and Database Administrators deliver current software versions to the test environment, install the application’s software and apply software patches, to both the application and the operating system, set-up, maintain and back up test environment hardware. Depending on the project, one person may wear more than one hat. For instance, a Test Engineer may also wear the hat of a Database Administrator. Q: What is a Technical Analyst? A: Technical Analysts perform test assessments and validate system/functional test requirements. Depending on the project, one person may wear more than one hat. For instance, Test Engineers may also wear the hat of a Technical Analyst. Q: What is a Test Configuration Manager? A: Test Configuration Managers maintain test environments, scripts, software and test data. Depending on the project, one person may wear more than one hat. For instance, Test Engineers may also wear the hat of a Test Configuration Manager. Q: What is a test schedule? A: The test schedule is a schedule that identifies all tasks required for a successful testing effort, a schedule of all test activities and resource requirements. Q: What is software testing methodology? This methodology can be used and molded to your organization’s needs. G C Reddy believes that using this methodology is important in the development and ongoing maintenance of his clients’ applications.